UMPC Choices: X70, U820, SK3, SC3, TN70M. Read This and Join the Live Session. I’m very lucky to have a clutch of new UMPCs right now so it’s only right that I put them all together for a comparison for you. I’ve taken a few sets of photo’s and added in a lot of notes. At the end of the article I summarise the devices so if you’re thinking about a purchase, take the time to read this article. Announcement: JKK and I will be live on Monday (6th July) evening at 2100 CEST (Berlin time.) We’ll be available for all your questions in the live chat and video session. I’ll also try to be available in the late afternoon (Central Europe) before Dynamism go live with their X70 offer at 1pm U.S. Eastern Time so drop into the chat room if you have a burning question. If i’m not there and you need an answer before the X70 goes on sale, put the question in the contact form. View all 5 devices in a comparison table. On this photo I’ve got the Raon Digital Everun Note, the Clevo TN70M, the Kohjinsha SC3 and I’ve got my hand on the Sk3 there. Clearly the SK3 is tiny. Almost as small as the Everun Note but including Ethernet port, ExpressCard, GPS, MicroSD and 3mp cam. Not to mention the swivel screen mechanism. Its an extremely advanced device in terms of industrial design. In these three images (click to enlarge) I’m comparing the SK3 to the U820. The U820 is only slightly smaller in terms of width but it has a 5.6 inch screen. The 7 inch screen on the SK3 is much nicer to use. It’s brighter, has better contrast and a wider viewing angle too. This is a great photo because it shows directly what happens when you leave the keyboard off! You reduce character input speed (by an average 30-50%) but end up with a smaller device. The X70 is tightly packed with a battery that is 1.5x the size of the battery in the SK3 resulting in much longer battery life. It’s not much lighter though. More images from this set. Three 7 inch convertible UMPCs. The TN70M is significantly larger but has a much nicer keyboard and larger battery. Over twice the capacity of the SK3 in the middle. It’s cheaper too but only has an 800×480 screen. For data input, the TN70M is the best of the bunch but you could easily argue the case for an ASUS T91, despite the fingerprint reader and touchscreen. Look at the difference between the SC3 and SK3. The battery has been relocated inside to make the SK3 look very slick and neat but it has 15% lower battery capacity than the SC3.. I don’t know how Kohjinsha do it but their screens are always bright and have excellent colour balance. The SK3 is even more glossy than the SC3 which makes for a stunning indoor image quality but kills the experience when outdoors. For in-car use I’d recommend getting a filter. Summarising the devices Clevo TN70M [Full specs and info] It’s an amazingly low cost entry point into touchscreen computing and comes with good options for upgrading memory and disk. It’s not pretty but it’s well built and the keyboard is great for writing articles or reports. The 800×480 resolution screen helps when using the device on a table (larger characters = easier to read) but you continually run up against the problem of oversize dialog boxes. 1024×600 is a better choice for a 7 inch screen resolution. It’s not really the best ultra mobile computing option though so we’d only recommend it as a home-based, project or children’s device. 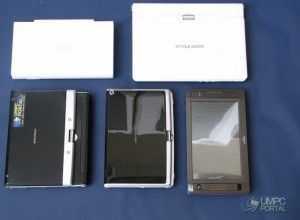 Kohjinsha SC3 [Full specs and info] Well-built and very compact for a 7 inch convertible UMPC. GPS and ExpressCard/34 slot may fit your requirements well. Extended batteries are available and it’s priced quite competitively through importers. 2-2.5hr battery life is a problem if you are a heavy mobile user. We also recommend Windows XP. The hard drive just isn’t up to the job of running Vista or Windows 7. The keyboard is OK for ‘pecking’ and thumbing but not for extended table-top typing sessions. Kohjinsha SK3 [Full specs and info] A real improvement in hardware design over the SC3. Impressively small for a convertible and including all the features of the SC3 plus a microSD card slot and 3.0MP cam. The SK3 is slightly more efficient than the SK3 but with the smaller battery, you won’t notice it. 2hrs ‘on-net’ and 4hrs e-book reading. Again, The keyboard is OK for ‘pecking’ and thumbing but not for extended table-top typing sessions. Fujitsu U820/U2010/U/B50N [Full specs and info] The lightest of the bunch and yet with a 5.6 inch screen that has a 1280×800 resolution which will require tweeks to Windows user interface to make it readable! The keyboard is very high quality but the screen size makes it very difficult to use on a tabletop. Recommended for microblogging and stand-up work. With the CF and SD card slot, it’s ideal as a digital photographers companion although outdoor visibility, as with most general purpose UMPCs, isn’t great. The Fujistu is able to idle for extremely long periods and can return 3hrs on-net use. The extended battery doubles that although we recommend two standard size batteries to keep the size down to a minimum when using as a ‘thumbing’ device. Viliv X70 [Full specs and info] Goes on sale on Monday 6th July and due to it’s high quality on-screen keyboard, good quality build, great feature set and outstanding battery life (4hrs+) deserves a place with the other ‘productive’ devices here. Despite the on-screen haptic-feedback keyboard, input is slower and much more stressful than on the convertible devices. It’s not the lightest though. Excellent loudspeakers make this a good multimedia device. Killer-feature: Fast SSD. The X70 feels far more fluid than any other device here due to the high quality SSD. Other devices to consider: Asus T91. At the heavy end of the ultra-mobile computing scale with it’s 9 inch screen in a 980gm shell but should be excellent value and capable of better keyboard input speeds than all the devices here. Should have great battery life too. Due: July Viliv S7. A high-end 7 inch umpc with the good quality Viliv build and, we assume, the high speed SSD. A wider keyboard (similar to the TN70M) will really help with input but the device is very slim and only weighs 830gm. Again, we’re expecting excellent battery life. May also be available with a 1.8 or 2.0ghz Atom CPU. This should be an extremely popular device when it launches. Expected July-August launch. Sept availability (estimated.) Good luck with your choices! Announcement: JKK and I will be live on Monday (6th July) evening at 2100 CEST (Berlin time.) We’ll be available for all your questions in the live chat and video session. Chippy: did you try to put the devices in (separately, separately that is :-) in a standard breast inner pocket of a standard German business suit jacket? It seems to be SK3, isn’t it? Sorry. SHould have annotated the pics. The one’s inside are the X70. The SK3 doesnt fit. I would really like to see examples using the built-in webcams. Still-images (of video) as well as video in low-light and regular-light conditions would be a blast. Whatever you can find the time to do, and is done in a fair, side-by-side manner. I would like one for Skype/msn use, and I find it extremely difficult to find relevant info about video quality (“1.3 megapixels” is imho worthless information). Buying one of those as a Skype device, then having to use an external webcam means that the device is more or less useless to me. SC3 and SK3 not yet tested. It would make a good topic for a post. I’ll try and get it on the schedule but it wont be for a few weeks. 1. For measuring framerate, I recommend “fraps”, http://www.fraps.com/ it will overlay the real framerate on top of the video. 3. For giving users with various quality demands a way to decide for themselves, I suggest posting a high-bitrate video of a living moving person, in “low” and “regular” lighting conditions (however you define those). For really “scientific” approach, having a “known reference” such as a high-quality still-image shot or Logitech pro 9000 video of the same scene would really give readers an impression of what to expect. 4. For use inside, I suggest finding the “power line flicker filter” (or similarly named) and choose 50Hz or 60Hz depending on where you live. “A real improvement in hardware design over the SK3.” I assume that ref should be “SC3”. Except of course for the same or lower battery life. Sigh. 7″ screen is a little too small for my needs, (sometimes I need to do presentation on my M912) so I would say my choice would be minimum 8.9″ or 10″ is even better. I am looking forward to Asus T91. BTW, there is new development in model variations for T91, check here: http://www.asustablet.com/t91a-t91go-t91-three-models-asus/ I am actually very interested in T91A, the only question if it will be delayed ’till October. 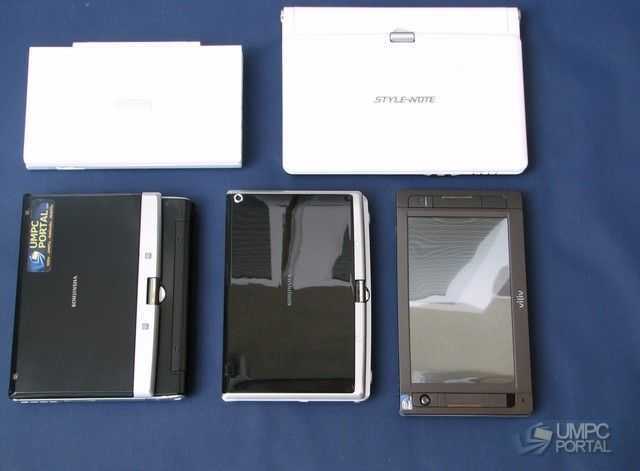 I still hope for an Everun Note clone with 45 nm native AMD Dual Core CPU, LED backlight, touchscreen with fine calibraion, GPS, accelerometers, flat battery e.g. covering the bottom, 3 year warranty (without ever needing it like it was made in Switzerland or Germany) and a perfect out of the box experience. And please no noisy and slow Samsung harddrive. Was even able to play Ankh or NHL 2005 with wine on my Note until I upgraded from Ubuntu 8.10 to 9.04 and lost Catalyst support. Have spent hours playing majesty instead. No peripherials needed (nice mouse sensor) and performance is already great when locked to 800 MHz. Hope next Ubuntu will bring major free radeon driver improvements. Pandora handheld will be great for homebrew and emulators but it’s nice to have a powerful x86 machine on the go too. They should have built everun note in 8.9 inch form factor with convertible screen, good battery life and convenient features( including standard keyboard ) Then, I think , is ultimate mobile device (gaming device) with ability to handle a lot of stuff. Everun note was not even noted as umpc choices, due to poor build quality , so as umid m1(ok, this may be mid). It is sad to see those devices . I think kojinsha’s design is the best to general public except battery..
7″ is definitely the max that fits into my pocket. Convertible would be nice but that would even raise failures. The sturdy case was a good start at least. I still love my note but it can always be done better – and especially this one a lot. At least I don’t have to deal with slow Atoms and Open GL uncapable GMA 500/950 graphics (DirectX numbers don’t count on Linux which I use on Desktop/UMPC/Netgear-Router and maybe mobile phone in the future). And most important I won’t buy any CPU of a company not playing fair and found guilty in a court decision. will there be any larger capacity battery available? « Archos 9 priced in the UK, Android powered 5â€ device in September?